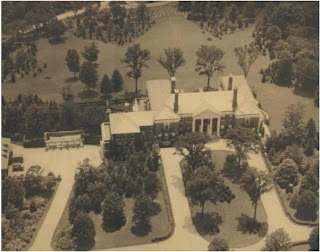 'Bonnie Blink', the Henry Phipps estate designed by Horace Trumbauer c. 1916 in Lake Success. Phipps was a partner and co-founder of Carnegie Steel, a noted philanthropist and patriarch of the Phipps family. All his children resided in the Old Westbury vicinity; Jay at 'Westbury House', Hal at 'Spring Hill', Howard at 'Erchless', Amy at 'Templeton' and Helen at 'Knole'. Today the residence is the administration building for the Great Neck School District. Click HERE to see 'Bonnie Blink' on google earth and HERE on bing. Photo from the Aiglon Archives. Any info on the origins of the house name? A miraculous survivor considering the suburbanization and roads that plowed through that area of Nassau County. "Bonnie Blink" means a beautiful vista, or countryside. To a Scot it would have a meaning signifying sweet contentment! Scottish for "Pretty View" or something like that. Not sure if it's true, but I was just informed from a reliable source that Knole has been demolished. I'm speechless. There has been alot of restoration happening at Knole over the last 2 years, I'd be surprised if that was the case. I can check it out later. It's possible that the source may not be as reliable as they claim, but it was a very recent incident, so that would rule out Knollwood. I'm hoping some good news will surface and this will all turn out to be a bad rumor. Does anyone have any information about the children who were brought to Bonnie Blink from London after the bombing in 1940 and stayed with Lady Margaret Barry (the evacuation was funded by Jay Phipps)? It was referred to as The Phipps Blanket and my significant other and I have some unanswered family history questions that concern this. The only reference to it are in Lady Margaret's online obituary and things we have heard from family members. Thanks!